As I explored the importance of these skills to enhance peer-to-peer and collaborative work among students in a classroom, I realized that teachers need the same skills to engage in co-teaching, peer coaching, and professional learning communities (PLCs). How do I employ the strategy as a listener to increase the engagement of my colleagues? How do I employ the strategy as a speaker to communicate with my peer? What is a real-world example? What is an example from your life? Can you add to this idea? What might be other points of view? How can we relate what I said to the topic/question? What is your take on what I said? What can we agree upon? What main points can we share? What key idea can we take away? 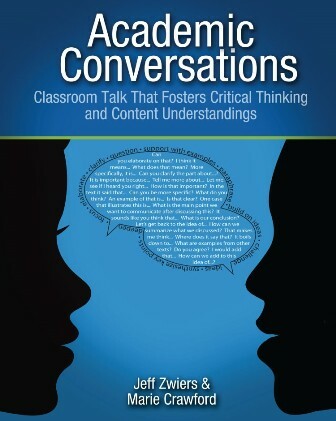 In many classrooms teachers need to provide structured opportunities for students to practice and build these collaborative conversation skills. As school leaders, you may need to provide similar structured opportunities for teachers to practice collaborative conversation. Here is a strategy I use for teachers to review short research summaries. In groups of four, the first person reads the summary out loud. The second person paraphrases the summary. The third person identifies her experiences that reinforce or challenge the research. The fourth person identifies implications of the research for her classroom or school. Change roles and begin another research summary. Super article! Wow! This is spot on! Can’t wait to purchase the book! Thank you, Steve!! Timely, relevant information – so helpful for engaging students in learning.